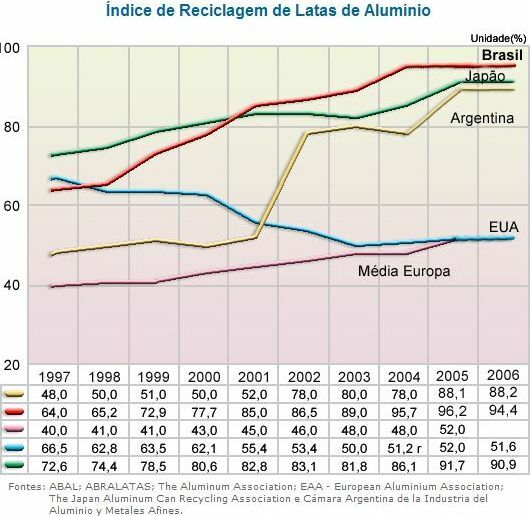 The Brazilian Aluminum Association (ABAL) recently announced that Brazil recycled 139,100 metric tons (Mt) of aluminum cans (about 10.3 billion cans) in 2006 for a recycling rate of 94.4%, assuring the first-place position for Brazil for the sixth year in a row, ahead of Argentina, Japan, Switzerland, Europe and the US (click on chart to see larger version). A few Temas observations about the first chart, provided by ABAL. First, Brazil‘s 2006 rate, just like those for the US and Japan, dropped slightly (1.8%), even though Brazil collected 9% more in volume than in 2005 (139,145 Mt vs. 127,568 Mt). 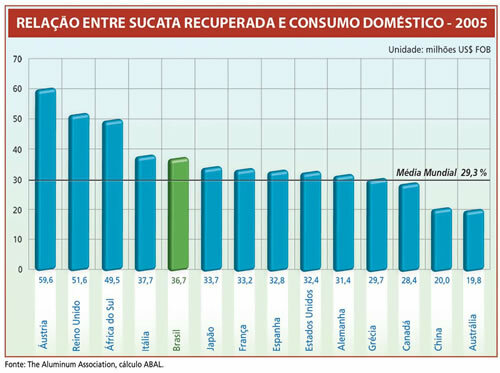 The trouble is, Brazil’s domestic consumption of aluminum cans rose 11%, from 132,602 Mt to 147,417 Mt. The industry needs to work to ensure that the recycling rate dip is just a temporary blip, and not the start of a downward trend. Industry tends to point to the steep drop in the worldwide price for alumina during 2006 as the reason for the recycling rate slump. Yet scrap aluminum cans still command a better price than most used packaging (in Brazil, a kilo of aluminum can scrap gets 25 times more than a kilo of tetrabrik, 13 times more than a kilo of scrap steel can, and five times more than a kilo of PET) and more and more Brazilian cities (327 at last count) are instituting “selective collection” schemes that encourage aluminum can collection. 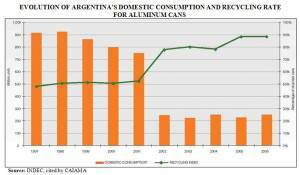 Second, Argentina, in contrast, had a slight uptick — 0.1%, representing 20 million more cans collected than in 2005 — despite a 9.8% rise in domestic can consumption (local production plus imports). Argentina is within two percentage points of overtaking Japan in the No. 2 slot globally. 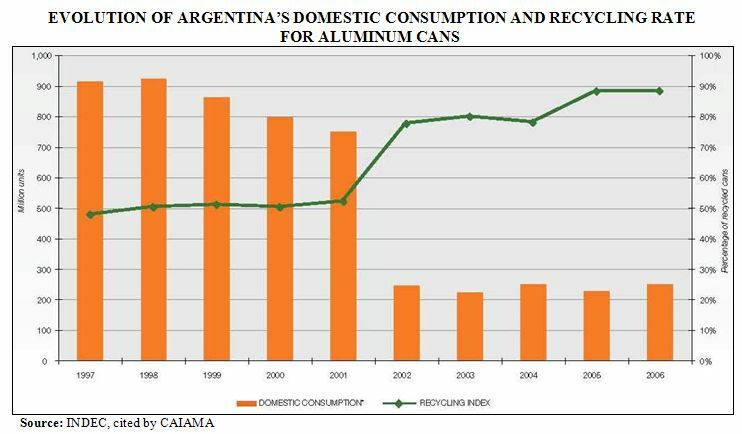 However, a caution: Argentina reached the upper echelons of aluminum can recyclers more by its huge drop in aluminum can consumption in the wake of its economic crisis in 2002 — consumption is now only one-third of what it was in 2001 (click on chart at right to enlarge). Third, as I pointed out in my post on metal recycling, the aluminum industry is directing attention to strong recycling in its can segment because rates for the industry as a whole are not nearly as impressive. 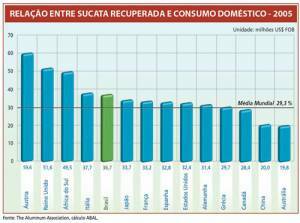 For example, in 2005 (the latest data provided by ABAL) Brazil’s sector-wide recycling rate was only 36.7%, but even so, that put it behind only Austria (59.6%), the UK (51.6%), South Africa (49.5%) and Italy (37.7%). He notes that even as Brazil achieved and held leadership in aluminum recycling over the past decade [Temas Note: he makes a serious mis-statement here, since Brazil has been a leader in aluminum can recycling, but not necessarily in overall aluminum recycling], it increased its mining of bauxite and its aluminum production, in the process increasing, rather than reducing, mining impacts, the industry’s energy consumption and production waste generation. Most of this increased production was exported [Temas Note: 62.6% of tonnage produced in 2005, according to the Mines and Energy Ministry (MME) statistical yearbook], most of those exports (80% in 2005) in the form of primary aluminum (ingots, plates, billets), followed by semi-finished aluminum sheets (18% in 2005). Cortez argues that, in essence, aluminum can recycling was promoted heavily in Brazil so that the scrap could cover domestic demand, freeing up industry in Brazil to focus on raising its share in the world aluminum market. What are the costs of such a strategy, asks Cortez. 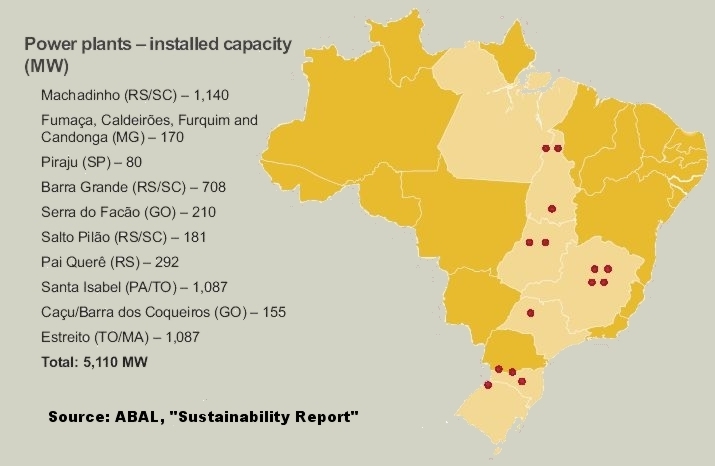 The aluminum industry, already one of Brazil’s largest sectoral users of electricity [Temas Note: about 6% of total electrical power produced in Brazil when self-generation is factored in], keeps demanding more. He suggests that the real reason the government is constructing several of the planned hydroelectrical plants in Amazonia is to sate the electrical appetite of the aluminum industry. This means flooded lands, lots of people relocated, big public debt, subsidized rates, etc. all to cater to one industry, he alleges. 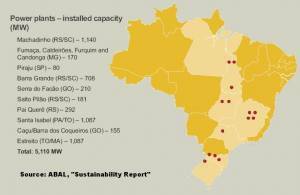 Who is really gaining from Brazilians recycling their aluminum cans? Cortez argues that if Brazil continues to use can recycling simply to allow boosted exports of primary aluminum to more industrialized nations such as the US and Canada [Temas Note: actually, Canada is not even among the top six destinations for Brazilian aluminum exports — it is far more likely to be Japan], then it is those nations who benefit because they can make higher-value finished products using Brazilian inputs without paying the environmental costs Brazil pays to make and export those inputs. He urges Brazil to rethink its economic model’s stresses on exports of primary products, particularly minerals, primary aluminum, meat and grains. Cortez concedes that aluminum can recycling in Brazil plays an important social role — it is the chief revenue earner for an estimated 150,000 catadores (wastepickers/informal recyclers) [Temas Note: ABAL claims that the number is closer to 170,000]. He also feels that recycling can and should be promoted — but not to be used as an excuse to avoid a debate about the aluminum’s industry environmental impacts and role in Brazil’s economic development. It is true that Brazilian aluminum production has increased in recent years (from 1,132,000 Mt in 2001 to 1,500,000 Mt in 2005), that much of this has been exported, and that most of the exports have been in the form of primary aluminum. It is true that aluminum production already accounts for about 6% of total Brazilian electricity consumption, and that a significant portion of the planned output for some of the hydroelectric plants proposed or under construction is earmarked for the industry. 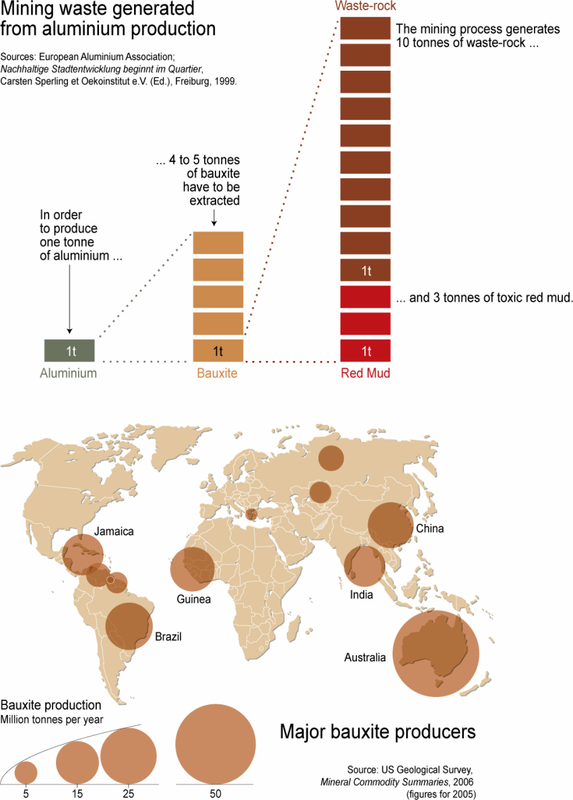 It is true that bauxite mining and aluminum refining and smelting produce significant wastes (click on the UNEP/GRID graphic about the former to see a larger version). But the rest of his scenario has problems, and does not fit together as smoothly as he suggests. First there’s the implication that the aluminum industry has been misleading the Brazilian public over the years, getting them to recycle aluminum cans for the wrong reasons. I’ve read the recycling literature of ABAL and its members over many years, and yes, I’ve seen them use the lower energy costs and greenhouse gas (GHG) emission arguments in favor of can recycling. But no, I haven’t spotted them claiming that it would reduce bauxite mining in Brazil, cut the Brazilian industry’s energy consumption to a fraction of what it was when can recycling was launched, or claim that Brazilian aluminum smelting and its GHG emissions would drop dramatically. They are a bit too careful for that. Second, let’s look at the contention that aluminum can recycling in Brazil has been used to take care of domestic demand for cans and free up production for export. 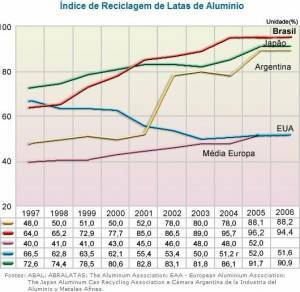 In fact, can recovery may come close to covering domestic can consumption, but it comes nowhere near covering just Brazil’s domestic consumption of transformed aluminum — can recovery tonnage only equaled 17.34% of domestic transformed aluminum consumption in 2005. As for primary aluminum production, can recovery tonnage only compared to 9.27% of primary production in 2005. Hence, if can recycling is being promoted as a way to free up production capacity, then it is freeing up little. I might add that Brazil actually imports aluminum scrap — 43,119 Mt in 2005 as a matter of fact (20% from Venezuela, 18% from Chile, 11% from the US, 9% from Colombia, 5% from Paraguay), one third as much as the tonnage collected from cans domestically. In other words, the Brazilian aluminum industry already consumes much more scrap than domestic can collection programs can provide. Third, let’s examine the implication that recycling tonnage should have resulted in reduced production, and reductions in the associated environmental impacts. Given the metal’s prices and the growth in world aluminum production (all major producers have increased production, with China more than doubling it from 2001 to 2005) and consumption in recent years, how does Cortez expect this to have occurred? Brazil does not operate in an economic vacuum. 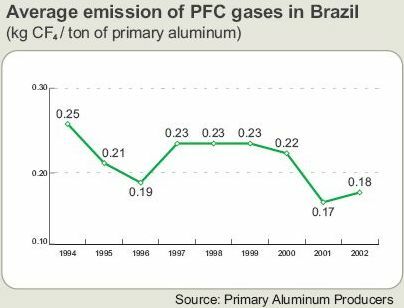 Perhaps if primary aluminum production had been capped by government fiat, the can recycling would have reduced Brazil’s total aluminum production levels. As it was, the collected scrap tonnage probably kept new primary production from going even higher than it did. Fourth, how about the contention that Brazil should focus more on exporting semi-finished or finished aluminum goods rather than primary aluminum? While that might be better for Brazil’s balance of trade, would it necessarily be a good thing for its environment, the stated concern of this editorial? I’m not so sure. To extrude, cast or roll aluminum and then fabricate those finished products that Cortez advocates, you still need either primary aluminum from a smelter or secondary from scrap. If the former, Cortez’s suggestion would not result in any significant energy savings, since the largest portion of the aluminum industry’s energy consumption comes from smelting. In fact, the new extrusion, casting and rolling facilities might add to the energy burden. Would that be a big concern, given that the industry primarily derives its electricity needs from hydropower? Well, beyond the impacts of heavy hydropower reliance that Cortez mentions (submerged lands, displaced people, etc.) there is also the question of greenhouse gas emissions (methane) from such dams, although Brazilian scientists recently seem to have worked out a solution to that. The biggest way to cut the aluminum industry’s energy consumption? More recycling. Processing scrap requires 5% of the energy needed to make primary aluminum. But probably more important are the greenhouse gas (GHG) emissions associated with aluminum refining and smelting, including perfluorocarbons (PFCs), polycyclic aromatic hydrocarbon (PAH), fluoride, sulfur dioxide (SO2) and carbon dioxide (CO2). ABAL says that in Brazil’s case, the greatest GHGs of concern are the PFCs tetrafluoromethane (CF4) and hexafluoroethane (C2F6), released primarily during smelting. PFCs have a greenhouse warming potential 6,500-9,200 greater than that of CO2, and they persist in the atmosphere for thousands of years. 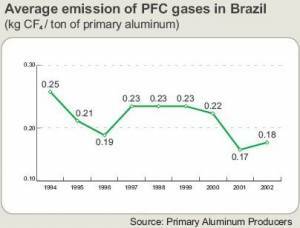 Brazil’s aluminum producers currently are trying to reduce their PCF emissions. The biggest way to cut PFCs associated with aluminum production? More recycling. The more recycled scrap utilized, the less smelting required. More than anything, I think the case is there for much more aluminum recycling in Brazil, no matter if Brazil attempts to shift production to higher value semi-finished and finished goods or stays with primary aluminum. And it means recycling more than just drink cans. It’s easier to promote can recycling for several reasons (tangible symbol all consumers see, aluminum does not have to be separated from other materials in order to recycle, fetches good price as scrap and thus many collectors eager to get it, etc. 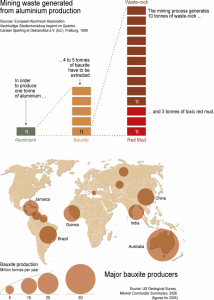 ), but there’s a lot more aluminum scrap sources that Brazilian industry could be promoting recycling of. For example, in the 29% of Brazilian aluminum consumption presently devoted to containers and packaging, there’s more than just drink cans that can be recycled by enlisting consumer help — there’s foil wrap, bottle caps, the fraction used in aseptic packaging (tetrabrik), toothpaste and ointment tubes. I suspect that if my father as a consumer helped recycle such items at high levels for the US during World War II, modern Brazilian consumers can do it too. The 25% of Brazilian aluminum consumption devoted to transport includes airplanes and motor vehicle parts. 13% involves construction materials (cladding, windows, skylights, gutters, door frames, roofing, etc. ), many of which should be captured by the growing construction and demolition (C&D) waste recycling efforts in Brazil. Then there’s 9% apiece for durables (primarily appliances) and electrical power lines and wiring. Achieving high recycling rates for these other segments will require more education, promotion and incentives — by industry, government and nongovernmental organizations promoting recycling — but the environment benefit payoff could be well worth it in lower energy consumption, reduced production wastes and lower GHG emissions. But in a way Cortez is right: it’s time for Brazil to stop simply patting itself on the back for its aluminum can recycling, and instead enter into a clear, honest public debate about the type of aluminum industry Brazil wants/needs, its environmental pluses and minuses, and how recycling can shape all of the above. A reciclagem é pauta permanente nas teses ambientalistas e sempre comemoramos os índices crescentes de reciclagem. Mas, no que se refere à reciclagem de alumínio, caímos na armadilha da mentira de boa-fé, se é que isto existe. Explico melhor – Sempre dizemos e ouvimos dizer a importância da reciclagem do alumínio para o meio ambiente, porque a reciclagem reduz a demanda pela extração de bauxita, reduz a demanda por energia elétrica e minimiza a geração de resíduos tóxicos. Seria ótimo se fosse verdade, mas infelizmente não é. O Brasil é recordista mundial na reciclagem de alumínio, com a marca de 96,2%. Somos os maiores recicladores de alumínio, seguidos de perto pelo Japão com pouco mais de 92%. Os EUA, por exemplo, reciclam “apenas” 52%. Somos mais conscientes do que eles? É pouco provável. Se o mito fosse verdadeiro já teríamos reduzindo drasticamente a extração de bauxita, a demanda de energia e a geração de resíduos. É o que seria lógico diante de seguidos recordes de reciclagem. No entanto, nos últimos 10 anos, tivemos crescentes recordes anuais de extração bauxita, de demanda de energia na produção de alumínio e na geração de resíduos do processo de produção. A produção brasileira de alumínio primário cresce, há mais de 10 anos, acima de 3% ao ano. Reciclamos cada vez mais e, ao mesmo tempo, produzimos cada vez mais alumínio primário. Como é possível? Simples. A reciclagem de alumínio permite atender ao mercado interno, facilitando a crescente exportação de alumínio plano, semi-acabado. Assim o atendimento ao mercado interno pela reciclagem, aumenta o potencial de exportação. No caso brasileiro, a reciclagem é socialmente importante (mais de 150 mil pessoas dependem disto, dos catadores às cooperativas de reciclagem), mas em nada reduz o impacto ambiental, exceto no que se refere à redução de carga nos aterros sanitários e lixões. A enorme demanda de energia elétrica para a produção do alumínio plano é a real razão para o rolo compressor ativado para a construção das hidrelétricas na Amazônia. Imensas áreas de floresta alagadas, milhares de pessoas removidas, gigantescos financiamentos públicos, tarifas subsidiadas, e todas as demais benesses que esta indústria sempre recebeu. Ancorado no argumento do risco de apagão, o governo continua investindo no aumento da geração de energia elétrica para atendimento à indústria eletro-intensiva, que sozinha consome 1/5 de toda a geração brasileira. É o caso da usina de Estreito, no Maranhão, que será construída especificamente para atender a indústria de alumínio no Maranhão e a mineração no Pará. Aliás, depois de décadas de pesados subsídios, não são perceptíveis os reais resultados sociais e econômicos para a população do Pará e Maranhão. Assim podemos inferir que a reciclagem é extremamente importante para o meio ambiente do Canadá ou dos EUA, onde as grandes produtoras de alumínio, por exemplo, fazem o beneficiamento do alumínio plano, com pouca demanda de energia elétrica e reduzida geração de resíduos, obtendo, com baixos impactos sócio-ambientais, produtos com elevado valor agregado. Como em outras áreas, é a versão século XXI do modelo colonial, no qual as colônias exportavam produtos primários (com pequeno valor agregado) para beneficiamento pelas metrópoles, as quais reexportavam (com grande valor agregado). Foi assim que as colônias financiaram o desenvolvimento dos países colonialistas e ainda é assim que o terceiro mundo financia os países que se dizem desenvolvidos. Portanto, dizer que a reciclagem é benéfica para o meio ambiente no Brasil é uma meia-verdade ou, se preferirem, uma meia-mentira. Podemos e devemos incentivar a reciclagem, mas isto não deve nos anestesiar em relação à questão principal: Precisamos iniciar as discussões sobre este modelo econômico escorado na exportação de produtos primários, com destaque para minério, alumínio primário, carne e grãos. É necessário questionar a quem serve este modelo e a quem beneficia. Congratulations for the post. Very interesting. Moreover, the subject is very unexplored.